My lemon tree is overloaded with lemons. I have so many lemons that I can’t even give them all away. 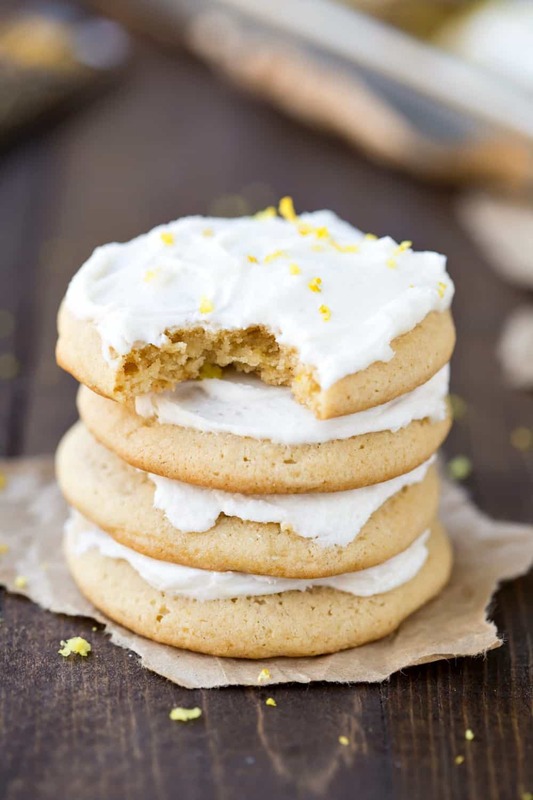 I hate to see them go to waste, so that means sneaking lemon into anything that I can – like these Lemon Sour Cream Sugar Cookies. 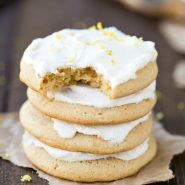 I used a combination of lemon flavor and plenty of fresh lemon zest to give these tender cookies a nice taste of lemon. The cookies are topped with a basic buttercream frosting, and I grated an extra sprinkle of lemon zest on for a little more color and lemon flavor. 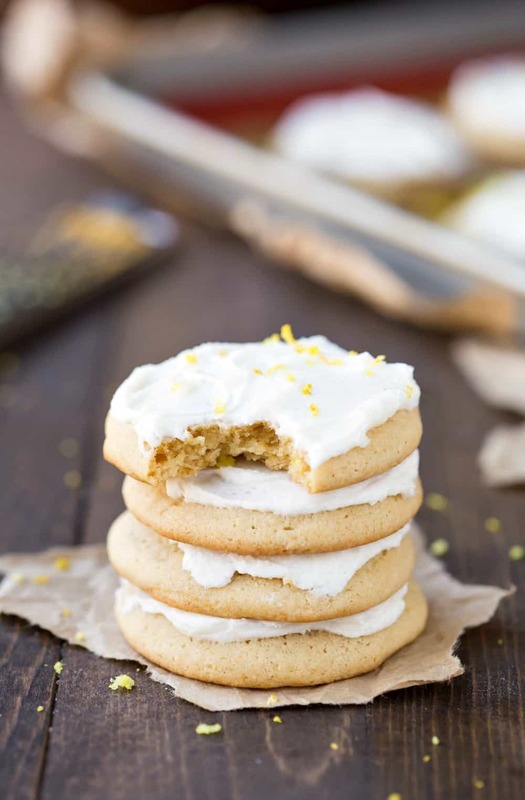 Lemon sour cream sugar cookies are soft and tender sugar cookies that have the extra zing of lemon and are topped with a lemon buttercream frosting! Preheat oven to 350 F. Line two baking sheets with parchment paper or silicone baking mat. In a mixing bowl, whisk together flour, baking powder, and salt until combined. Set aside. In a large bowl, beat together butter and sugars until well-combined. Beat in egg yolks one at a time, scraping down the sides as necessary. Mix in vanilla extract, lemon flavor, lemon zest, sour cream, and milk until combined. Batter may look curdled at this point. Add dry ingredients, and mix until just combined. Scoop dough using a medium cookie scoop (1.5 tablespoons), and drop onto prepared baking sheets, spacing cookies 2-inches apart. Let cool on baking sheet for 10 minutes. Transfer to a wire rack to finish cooling. To make the frosting, beat together butter, powdered sugar, 2 tablespoons milk, vanilla, lemon zest, and salt. Beat until well-combined, adding in additional milk as needed. Frost cooled cookies with frosting. Make sure that the butter is at cool room temperature, not room temperature or melting. The butter should dent if poked but shouldn't be warm. If the butter is too warm, the cookies won't hold their shape and will end up flat. These cookies are devine. Perfect amount of lemon to sugar ratio. Delicate and yummy! Thank you so much! I’m glad that you liked the cookies! =) Thank you for commenting! Not only did you bake some frankly gorgeous looking cookies, but you also grew the lemons yourself? Amazing!